Hagos Theme Try the Hagos restaurant website theme and build a bespoke site for your restaurant. Get new customers online and earn more thanks to the online ordering system integration. Build your own restaurant website The Hagos restaurant website theme will allow you to build your own site, one that’s completely tailored to your restaurant. Use the simple CMS from UpMenu that will support you in creating your website. You can create a really effective restaurant website that will earn you money, and all without the help of IT specialists. Make the most of the Hagos restaurant website theme. 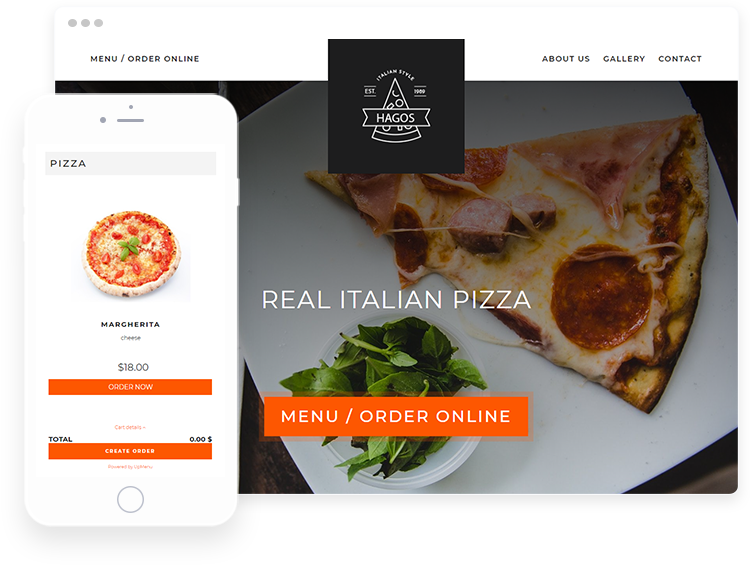 Theme matched to online ordering All restaurant website templates from UpMenu are built to help you realise more food deliveries and takeouts and generate more profits for your restaurant. Make it easier for your customers to place their orders. The Hagos restaurant website theme has intuitive online ordering, and menus with online ordering on the homepage. Thanks to this, the conversion of online orders will be greater. Use restaurant website theme CMS, which includes the UpMenu system, will allow you to match the Hagos restaurant theme to your restaurant's brand. Add a logo, choose the right colours and enter your menu. In this way, you will start to build your restaurant's brand on the internet. Show yourself to customers and let them order online. Increase profits with the Hagos restaurant website theme. Intuitiveness and design Your Restaurant website must be really intuitive in order to ensure you increase the number of online orders. The complicated structure will prevent customers from placing an order and then visiting your competition’s website. The Hagos restaurant website template immediately directs the customer to the menu with the option of ordering food online. This is the best practice that helps hundreds of UpMenu customers generate more profits.